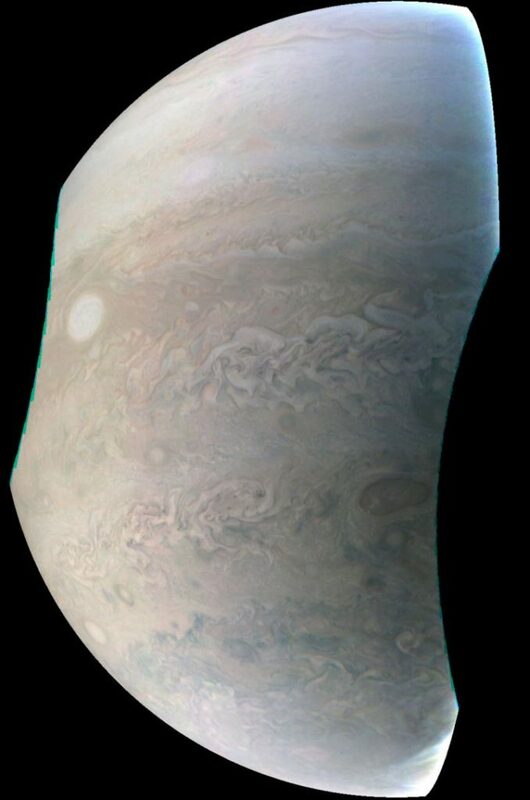 December 14, 2016 – This image, taken by the JunoCam imager on NASA’s Juno spacecraft, highlights the seventh of eight features forming a ‘string of pearls’ on Jupiter — massive counterclockwise rotating storms that appear as white ovals in the gas giant’s southern hemisphere. Since 1986, these white ovals have varied in number from six to nine. There are currently eight white ovals visible. NASA’s Jet Propulsion Laboratory, Pasadena, California, manages the Juno mission for the principal investigator, Scott Bolton, of Southwest Research Institute in San Antonio. The Juno mission is part of the New Frontiers Program managed by NASA’s Marshall Space Flight Center in Huntsville, Alabama, for the Science Mission Directorate. Lockheed Martin Space Systems, Denver, built the spacecraft. Researchers and students from CU-Boulder’s Laboratory for Atmospheric and Space Physics (LASP) are involved in the Juno mission. Sierra Nevada Corporation also contributed to the mission.